Last week, my colleagues and I were honored to join one of our customers, Roshan, one of Afghanistan’s largest telecommunication providers, when we were recognized at the Global Telecoms Business (GTB) Innovation Awards in London. There, we received an accolade for advancing the industry’s ability to protect operators’ revenues from the growing threats of mobile roaming fraud and revenue leakage. This is recognition for both Syniverse and Roshan for the success that comes in working in close cooperation with one another. 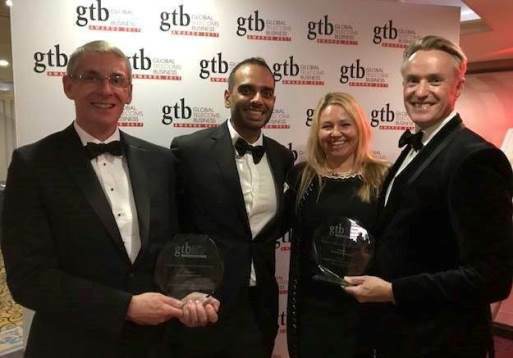 Our team at the GTB Innovation Awards ceremony: (from left) me; Imtiaz Esmail, CFO, Roshan; Anna Gussmann, Senior Customer Operations Director, Syniverse; and Alastair Hanlon, Vice President, Enterprise Solutions, Syniverse. Specifically, we were recognized in the Software Applications category for our collaboration in implementing predictive analytic and automation solutions that detect, identify and prevent fraudulent activity from occurring, and also protect revenues by ensuring accuracy in subscriber billing. Our collaboration relies on Syniverse’s platforms, which leverage the intelligence we gather from over 130 operators across the world to provide an instant, global view of suspicious activity that is occurring in the market. In this way, Syniverse serves as a central repository of fraud data able to optimize the speed of detection and allow Roshan to proactively act on the alerts that Syniverse provides. Similarly, the revenue assurance portion of our collaboration integrates domestic, international, retail and wholesale processes into a single architecture to enhance the end-to-end billing cycle. This enables rapid detection and automation that eases the task of analysis and issue resolution, and ensures the integrity of revenue processes. We’re honored to have our work with Roshan recognized for advancing the way operators are able to protect critical infrastructure and billing systems from revenue leakage. Evolving technology and rising connectivity demands have left operators vulnerable to threats from fraudsters and even more susceptible to inaccuracies in revenue collection. We look forward to continuing our collaboration with Roshan and other customers to continue to help the mobile industry better protect operators’ revenues from the threats of roaming fraud and revenue leakage.